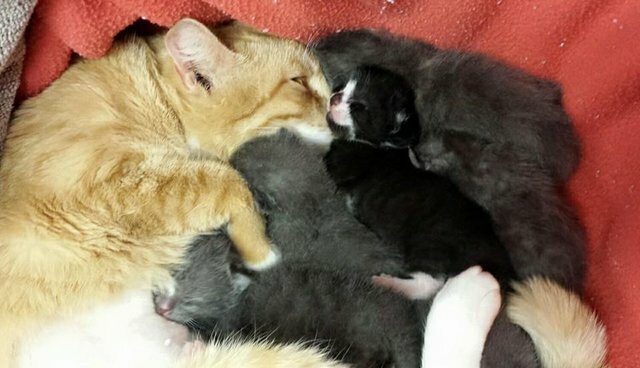 Six tiny newborn kittens are getting a second chance after being dumped in a trash can outside of a South Carolina Walmart, and now they have a sweet surrogate mom to look after them. 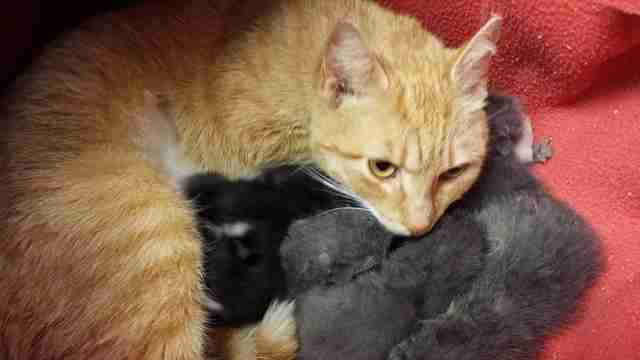 Collette Bouchard discovered the discarded kittens after hearing sounds coming from the garbage bin. "They were newborn kittens, there was still the umbilical cords attached to them, they were still wet so it looks like they were literally born and tossed right in," Bouchard told Charlotte, North Carolina news outlet WBTV. The brand-new kittens were then taken to Indian Land Animal Hospital for care, where the hospital's staff paired them with Sandy, a nurturing cat who had just lost her own litter. "She fell in love," Indian Land posted on Facebook, "This is so heartwarming for us to watch her cuddle up with these orphans." In a few weeks, Sandy and the kittens will be ready to go to new forever homes. For now, however, they're each other's family. "Sandy loves them so much," the hospital posted on Monday. Warm weather often means an influx of orphaned kittens in shelters across the country. To find out what you can do to help, contact your local shelter or Humane Society.